As an NBA fan, I'm familiar with McCallum's work and have read his books on the 1992 Dream Team and the 7 Seconds or Less Phoenix Suns teams. 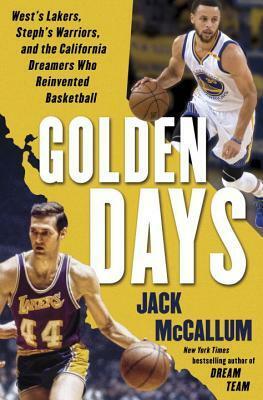 Golden Days follows a similar approach to those books where McCallum uses his extensive basketball connections to embed himself with the team (or teams in this case) and get seemingly any and everyone of importance on the record. In this case, he stitched together a connection between the 1971-72 Lakers, who put together what is a still a US pro sports (NBA, NFL, MLB, NHL) record of 33-straight wins, and the present day Golden State Warriors (2014-15 thru present) through the bridge of Jerry West. West was a key player on the 71-72 championship Lakers team and spent a few years in the front office of these modern-day Warriors. Against the parallels (Golden State won 27-straight games in 2015-16 and set the NBA record for single season wins with 73) is the backdrop of curmudgeonly former players (Oscar Robertson, Charles Barkley come to mind) who struggle to accept the modern-day GSW juggernaut and the league’s stylistic evolution. McCallum toggles back and forth each chapter between the Lakers and Warriors, dipping deep into a well of history, research, and interviews to piece the stories together. His reporting and ability to get his subjects to open up are as impressive and comprehensive as they were in his other books. The two protagonists of this book are West and Stephen Curry – though, this almost becomes a light biography on Jerry West who pulls the whole story together. Golden Days is an easy read, the content engaging and the writing accessible. It’s also full of parenthetical commentary and musings from the author that give it an informal, almost blog-like feel. For me, this technique was more distracting than it was entertaining. The only time I can recall it adding to the story was when McCallum offhandedly mentioned that Carmelo Anthony couldn’t compare with Elgin Baylor. It’s not that I agree or disagree with the statement, just that it was a comparison that challenged me to think. (Also interesting how McCallum presents the statement without explanation which, in some ways, lumps him into the same category he critiques throughout the book: the older curmudgeon rejecting the greatness of the modern player and game. )On that last point about the difficulty of players from previous generations to accept or appreciate the modern game with its emphasis on skill and the three-point shot; West is presented as the antithesis, an old school hoops lifer, but with an appreciation and love of Golden State’s (and Curry’s) style and skill. McCallum uses Golden Days and West to clap back against the vocal critics who regale their audiences with the “in my day” crap ad nauseam. As part of making his case, McCallum occasionally takes shots at 1960s and 70s NBA. He talks about “digging” on post players (sending a help defender to double team or reach for the ball when a player has the ball in the post) and how a dig can’t compare to the sophisticated defenses constructed today. It’s an unnecessary tactic that comes off as forced and directed at a subset of critics. Beyond the author’s distracting commentary and pointed generational account balancing, McCallum’s straight up reporting is fantastic. The character contrasts between “Elegant” Elgin Baylor and the uber-serious, though also gossipy, West were new for me and intriguing given the challenges of those Laker teams. The details surrounding Baylor’s retirement and his blasé acceptance of it pretty much guarantee that I’ll need to read Bijan Bayne’s biography on the Laker great (the 33-game win streak started on the first without Baylor). There’s tremendous insight into the players who made up the 71-72 team including Pat Riley, Flynn Robinson, Jim McMillian, Happy Hairston, John Q. Trapp, and of course Wilt Chamberlain who rightly gets a load of attention. Random nuggets on former GSW general manager Larry Riley scouting a young Steph Curry alongside West’s own scouting approach are the types of insight I wish we had more of. I also give McCallum a ton of credit for his profiles of Warriors owners Peter Guber and Joe Lacob who both come off with levels of depth as opposed to early Lakers owner Jack Kent Cooke of whom I don’t recall anything positive being written or said. The things I disliked were mostly stylistic and weren’t enough to take away from what is a good read on Jerry West’s role in the great Lakers of 1971-72 and the potentially-dynastic Warriors of the mid-2010s. As a character, West is fascinating and even though there are other more dedicated volumes on the man (the autobiography, West by West and Roland Lazenby’s Jerry West), this is a worthy addition – and not really a story about the Golden State Warriors. (3.5) For any NBA fan, McCallum's books are must reads. This one is no exception and the stories here are fascinating, particularly the ones about the 72 Lakers and Wilt Chamberlain. And though I found his autobiography to be uninteresting, I'd read anything about Jerry West.However, I'm not sure the structure fully works with this one. McCallum tries to bounce back and forth between the two teams but he's cramming three years worth of storyline into the Warriors chapters while only having to deal with one monumental season for the Lakers. It leaves for a lot of redundancy. I think it would have been better for 90% of the book to have been about the Lakers and 10% about West's time with the Warriors.Also, McCallum has been writing for decades. And while I'm sure he is attuned to racial issues, I get the sense that he is trying to play catch up in these charged times more than writing about racism in a way that is organic to the story. For example, he talks about the Warriors getting set to play LeBron James in the 2017 Finals where he casually mentions that LeBron's house was vandalized with racist graffiti a few days prior. Yes that's horrible. But there's no other relation to context. Nothing about the racism most of LeBron's fellow players have faced. Nothing about how this may have affected LeBron in game one. Just an oh-by-the-way reference to something that happened in a paragraph (and page) that was about the Warriors. It was awful and it probably needed to be referenced but there were other parts in the book where he could have placed it. Otherwise, it's a good story that again, as an NBA fan, you have to read for the Laker tales (the Golden State stuff was, at least for me, mostly a rehash save for some inside baseball from West). Having read a lot of Jack McCallum over the years in Sports Illustrated, this book was familiar in a lot of good ways. McCallum's features always have a relaxed flow to them, even on the most action packed pieces of a basketball game. In a lot of ways, this was like reading an extremely extended feature from SI, where he could take all of the extra info that he found and show it to us. I felt like the strongest pieces of the book were the parts on the '72 Lakers. I think part of that comes from the distance from the subject, and that McCallum wasn't up against time to bring all the info in and really let us soak in the atmosphere of the team. The Warriors' parts weren't bad by any means, but they clearly didn't have the context around them and the extra information that McCallum was able to bring into the Lakers' sections. I think that mostly stems from the Warriors section happening in real time, and he had to write about it as it happened. While I was reading, I kept expecting to see more of a connection between the Lakers and the Warriors, besides the connection of Jerry West. In a lot of ways it seemed like West was an integral part of the Lakers sections but wasn't really as much of a focus on the Warriors sections, which could admittedly come from West's estrangement and eventual departure from the Warriors franchise at the end of the book. Really, that was my only complaint - I wanted to see more of a connection between the two, whether it was the way that they represented their times, or the way that West put an imprint on both of them. It was fine the way it was written, but it could come off as disjointed from time to time. Still, an enjoyable and recommended read!I received a free copy of this book from NetGalley in exchange for a fair review. I received an ARC of this book via NetGalley in exchange for my honest review.A compelling and informative exploration of the history of the NBA with Jerry West serving as the catalyst. Comparing the Wilt/West/Elgin Lakers with the Curry/Durant/Green Warriors and how these teams have shaped and have been shaped by the rest of the league is fascinating. Each team deserves (and has) books dedicated to their successes and failures, but this book was excellent at treating each team with the respect that they deserved without becoming a lovefest for one particular team. Jerry West being the connective tissue for both teams was quite inventive, and makes the book more interesting because you have a central figure to rely upon as the narrative progresses. This is a must read for any NBA fan, not just a Lakers or Warriors fan. Good insight into Jerry West and some new stuff on the Warriors but not the smoothest storyline structure here between early Lakers and current Warriors. I skimmed a good amount. Probably 4+ stars for those who don’t follow the NBA as much as I do, but otherwise, still an interesting read. A good read with a lot of good stories about Jerry West, Wilt, and that era. It ties to the Warriors but it is really about Jerry West. A really nice read about Jerry West, the connective person between the 33-win in a row Lakers of the early 70s and the current Warriors. There's some curmudgeon in the author. Loved it. Although the author gets a little full of himself, it's still a fun read. This is my first Jack McCallum book. 7 seconds or less and dream team are on my to be read list but this one came up first in the queue.This book makes the interesting contrast between the Golden State Warriors and the Los Angeles Lakers. 2 California based teams with very different histories who have never been rivals. The link between the franchises is Jerry West.Jerry West is the person who depicts the logo of the NBA unofficially. That's basically all you need to know about him and his importance to basketball. However there is more, this book is about West and his interactions throughout basketball and focused on his role with the Lakers and the Warriors.I think the NBA audience is the youngest fan base of all the major sports, so this book does a good job of bringing back probably forgotten history to many readers. Unfortunately i've heard younger people don't read books and this is book is probably a huge string of tweets. For me i watched the showtime lakers probably not live but i vividly remember Magic Johnson's HIV announcement.I liked the one chapter focus on the lakers followed by a chapter on the warriors and so on. I also appreciated the drive of Jerry West, someone who seemed to have it all, still being driven. It was good to see his humble upbringings and the focus on West Virginia as Americans struggle with the divide between have's and have nots and blue and red states.All in all an excellent book which i hope will be talked about like 7 seconds or less or the dream team. Golden State has gone from heroes to villains in 2 years and soon the gritty warriors of oakland may soon be forgotten as they become silicon valley's team.